?Leashed dogs are allowed on this trail, but it might be a challenging hike for your canine hiking buddy. Check out our favorite dog-friendly trails in Georgia for a great hike with your pup. 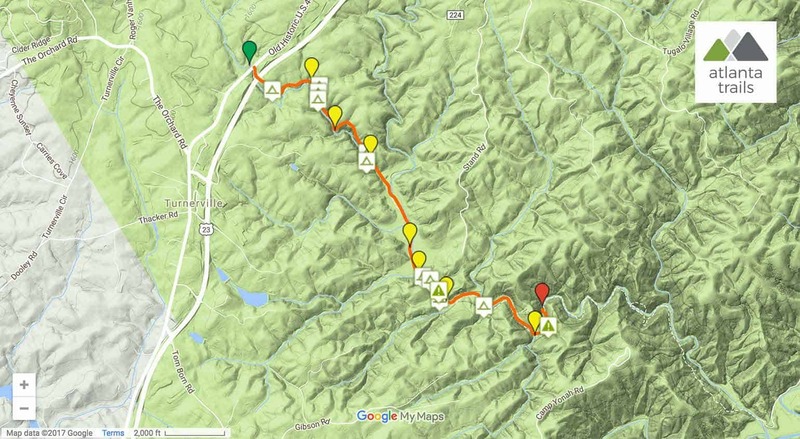 The adventure departs from the opposite side of Historic 441 from the Panther Creek picnic area (view maps and driving directions). The hike follows its namesake waterway downstream, traveling under a concrete overpass and diving into a young, mossy hardwood forest. The route ventures deeper into the forest and the sounds of the highway disappear in the distance. The trail crosses a small tributary creek at just under .5 mile. The trail begins to climb elevation, catching views of the cascading creek far below as it travels through a clearing. The creek’s turbulent roar echoes through the forest as it tumbles over several just-out-of-sight waterfalls. The hike passes several just-off-trail campsites before reaching a massive rock outcrop overhang at .85 mile. Due to heavy trail traffic, erosion has closed some sections of the trail recently; follow the green trail blazes for the current route. The trail rolls elevation, traversing a wooded area high above the creek valley. The hike descends to the creek’s banks, passing a large campsite and crossing the creek over a large wooden bridge at 1.5 miles. The trail explores a flat, sandy floodplain on the western shore, crossing the first of many small tributaries at 2 miles. The hike crosses another bridge and passes a large campsite, climbing elevation and rising high above the creek. Over the next mile, sections of the trail drop sharply and suddenly to the creek below, and the trail is extremely narrow. 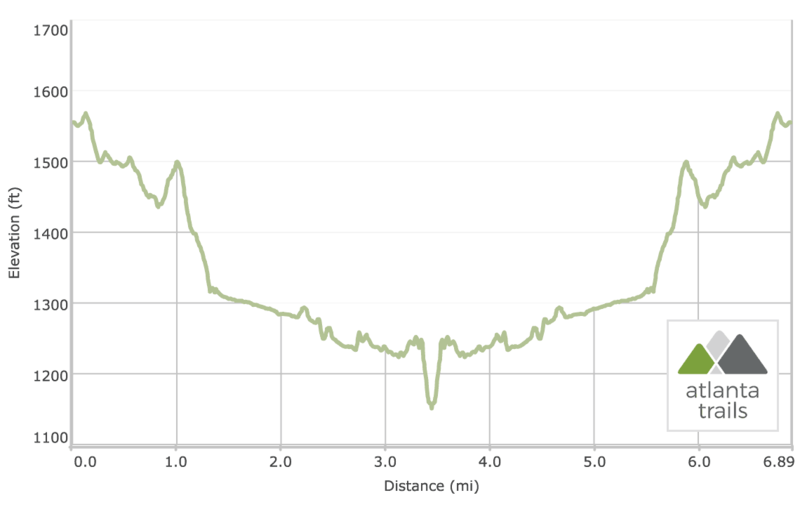 At 2.25 miles, the trail veers left at a fork and reaches a series of tumbling waterfalls soon after. The route scrambles over several massive, chiseled rock outcrops and makes several more tributary crossings, nearing the large waterfall downstream. The trail reaches the beautiful, multi-tiered waterfalls of the upper falls at 3.4 miles. Small cascades flow over a wide, tiered rock outcrop, pooling along banks filled with tall grasses and wildflowers. The hike crosses an enormous rock outcrop and descends to the base of Panther Creek Falls, reaching the towering waterfall’s sandy shores at 3.5 miles. Large, tumbled boulders line the creek’s sandy shoreline and make a great resting spot for viewing the beautiful, roaring tumbling waterfall. After soaking up some scenic North Georgia beauty, the hike departs the falls, following the outbound route in reverse. The hike reaches the trailhead at 7 miles, completing the adventure. 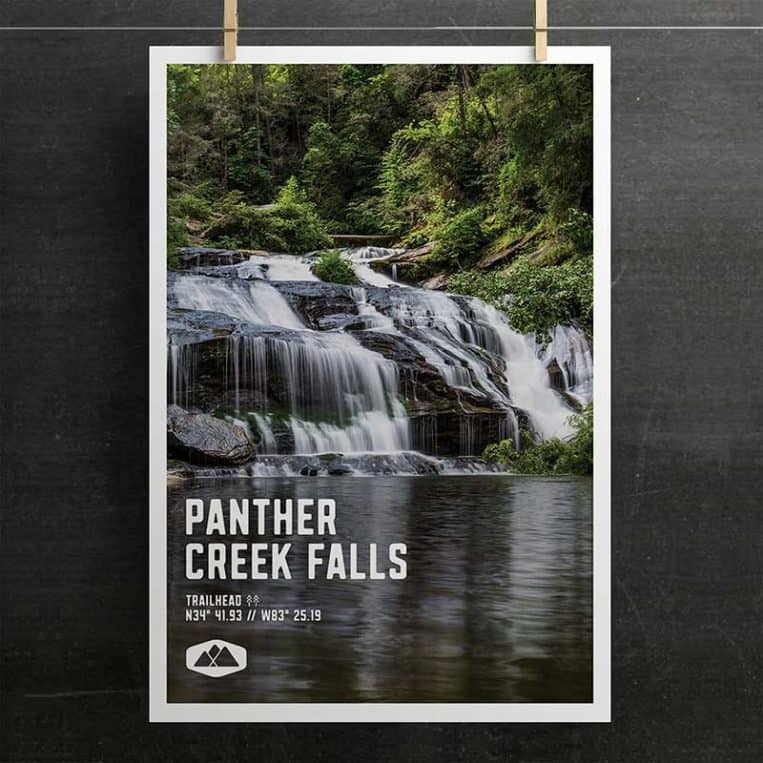 Follow an alternate, though much more difficult, approach to Panther Creek Falls from the trail’s eastern trailhead near Yonah Dam. The eastern trailhead offers a shorter route to the falls, but it’s a much more remote and strenuous hike, requiring some careful tracking and scrambling. 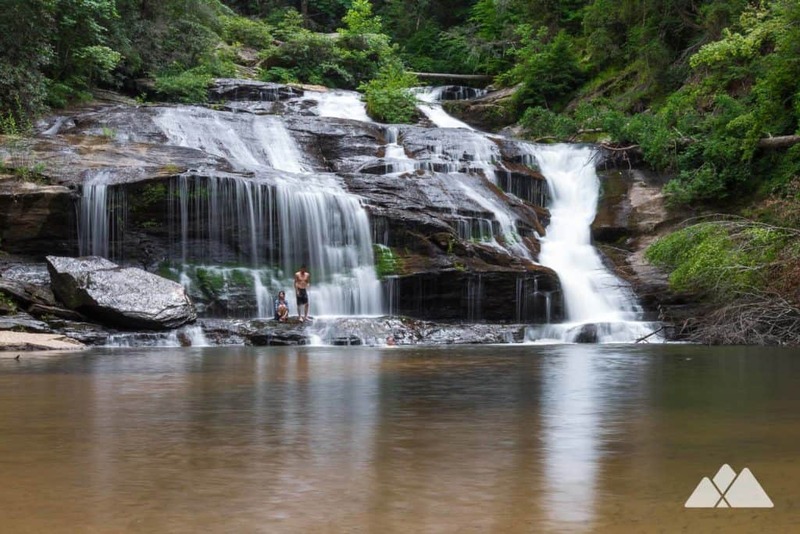 Or venture northward to the view-packed Tallulah Gorge State Park, and wander the park’s exceptional trails to lofty overlooks and views of the gorge’s incredible rushing waterfalls. 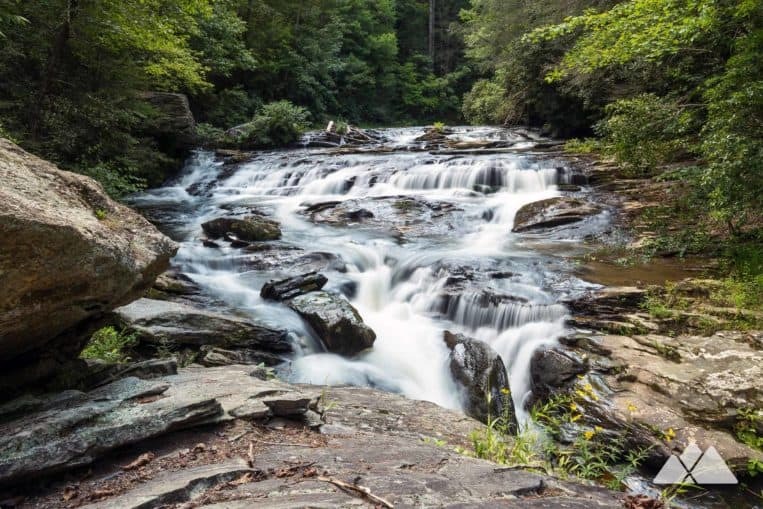 Just east of Clayton, follow a segment of the Bartram Trail to Pinnacle Knob, visiting the tumbling cascades of Becky Branch Falls and Martin Creek Falls before climbing to stunning overlook views. 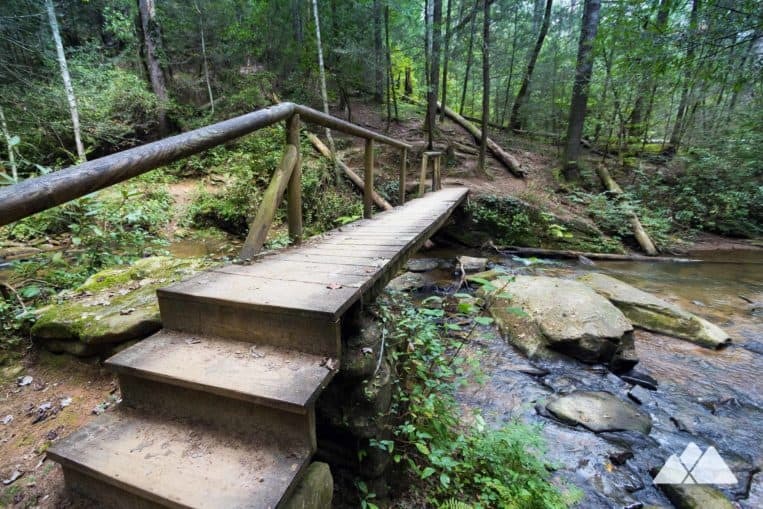 And check out the list of our favorite hikes near Lake Burton and Rabun County for even more nearby adventure inspiration. Parking at the trailhead is $4 (cash, daily).